Skill, wisdom, adroitness, elasticity, craft, cunning, deceit, theft. Sometimes occult wisdom or power, sometimes a quick impulse, a brain-wave". It may imply messages, business transactions, the interference of learning or intelligence with the matter in hand. "B" is a sound of internal activity, developing within a space closed by the lips and mouth-hence, a symbolic house. Its pronunciation is Bes, translated by a " House". The Sepher Yetsirah states that the letter B reigns in Wisdom. Wisdom is naturally the god Hermes, and its planetary attribution follows as a consequence, Mercury. Thoth, and his Cynocephalus, and Hanuman are included as correspondences. This Path, denominated "The Transparent Intelligence ", partakes of both the nature of Chokmah and Hod, both of which are Mercurial. The alchemical conception of the universal Mercury was that of a flowing, shifting, and unstable principle, ever changing. This may account for the baboon or monkey ever in attendance upon Thoth, for the monkey is restless, ever moving, and never still, typifying the human Ruach, which must be quieted. The Norwegian Odin-the infinite wanderer, would possibly be attributed here for precisely this reason. He is the spirit of life who, according to the legends, does not create the world himself, but only plans and arranges it. All knowledge issues from him, and he too is the inventor of poetry and the Norse runes. Its magical weapon is the Caduceus wand, which has particular reference to the phenomenon of Kundalini arising in the course of Yoga practices, particularly Dharana and Pranayama. 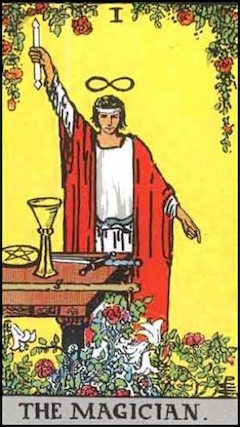 Its Tarot card is I-The Magician, who stands by a table on which are various magical implements, his Sword, Cup, Pentacle, and Sceptre, while in his right hand he holds an upraised wand. He points to the ground with his left hand, thus affirming the magical formula that" that which is above is like unto that which is below". Above his head, as an aureole or nimbus, is ∞ , the mathematical sign of infinity. Since Mercury and Thoth are the Gods of Wisdom and Magick, it is plain that this card is a harmonious attribution. Mastic, Mace, and Storax are the perfumes of this twelfth Path; the Agate is its jewel; Vervain its sacred plant. The Ibis is its sacred bird, which ages ago was observed to have the curious habit of standing on one leg for long periods of time, and to the fertile imagination of the ancients this suggested the absorption in profound meditation. In Yoga practice there is a posture called the Ibis wherein the practitioner balances himself on one leg. The rituals, moreover, address Thoth as "0 thou of the Ibis Head". Mastic, White Sandal, [[Nutmeg]], Mace, Storax, all Fugitive Odours.